It takes time if we talk about the beginnings of the door of the Holy Ka bah and its set-up from the time of Tubba AI-Himairi, who constructed the first door for the Holy Ka'bah, to the present Saudi period. But it is worth mentioning that the last door was made according to the instructions given by the Ottoman Sultan, Murad Khan, in 1045 H. It was coated with 160 pounds of pure silver. The first door was made according to the instructions given by King Abdul Aziz Bin Abdul Rahman AI-Saud (may his soul rest in peace). 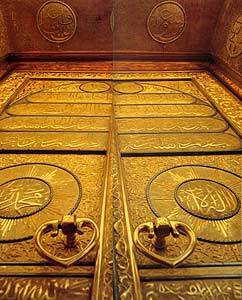 The Door was plated with gold and silver, and decorated with the Divine Names of Allah. It was erected during a great celebration in 1370 H.
The second door was made according to the instructions given by King Khalid Bin Abdul Aziz AISaud'(may his soul rest in peace). 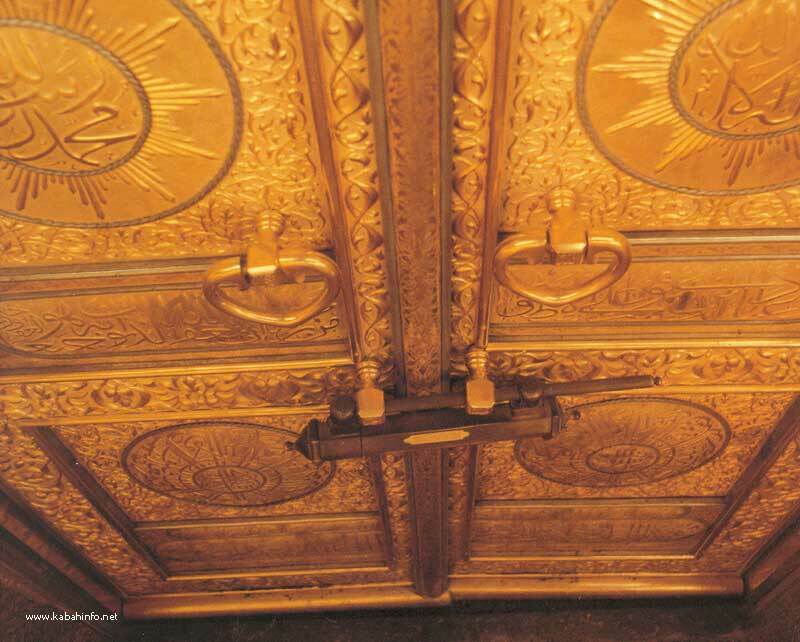 While inside the Holy Ka'bah, he noticed the age and scratched condition of the door. He gave his instructions for making a new door. The door was made of pure gold and with new specifications. (It is worth mentioning that the Custodian of the Two Holy Mosques, King Fahd Bin Abdul Aziz, Crown Prince at that time, gave his own instructions which led to this present work). 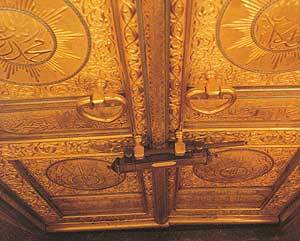 Bab Al-Tawbah, which leads to the roof staircase was renewed, and the door of the Holy Ka'bah and the Tawbah door were recast in pure gold. The cost of this was 13,420,000 Riyals, which did not include the price of 280 kilograms of pure gold, secured by the Saudi Arabian Monetary Agency. The work continued for twelve months, commencing from the first Dhul Hijjah 1398 H. A special workshop was established for the manufacturing of this door. Certain specifications were made with regards to the best designs and the firmly-established styles of Islamic motifs. The latest techniques were used in the structure of the door in order to achieve the highest qualities in strength, overall design and perfection. This work would ensure that the door would not need any future maintenance. The design and the preparation of the door were executed by specialized technicians, taking into consideration the climatic factors, such as the extreme heat of the sun and heavy rains. 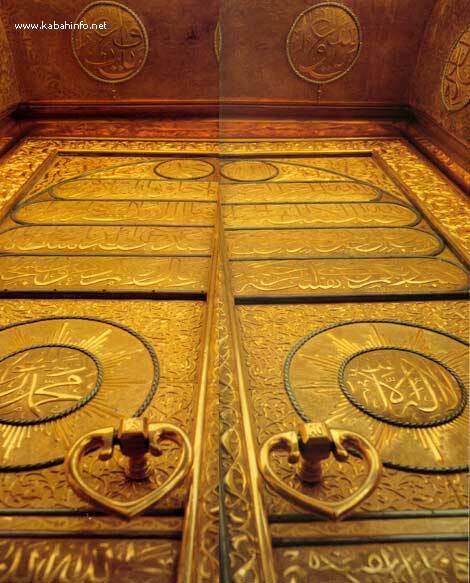 The bottom of the door was furnished with a support panel to prevent rains from entering the Holy Ka'bah. It contains a special bar to fix on the threshold when locking it. A new lock for the door of the Holy Ka'bah was also made. The old lock was provided by Al-Sultan Abdul Hameed in 1309 H. The new lock was made to the same specifications as the old one, as it also suited the design of the new door, guaranteeing no need for any maintenance in the future. As regards the decorations and the inscriptions on the dour, they were chosen from different harmonious components, the most important of which was the decoration of the surrounding frame. This decoration, at the level of the lock, heightens its focus because the lock of the Holy Ka' bah has a distinctively traditional and functional shape. Following these Qur'anic verses, there were two medallions set in square panels, in the middle of each there is the following writing: "There is no god but Allah, Muhammad is the Messenger of Allah". In the lower corners of the square panels, the two rings of the door were fixed, and together with the dour lock, they Dorm a harmonious, symmetrical design. In the middle of the two square panels, directly under the door lock, "Surat AI-Fatiha" is inscribed in another pair of medallions. Under these, there are historical notes done in smaller handwriting. The previous door was made during the reign of the Custodian of the Two Holy Mosques, King Abdul Aziz Bin Abdul Ralunan AI-Saud in 1363 H. Below this, another door was made by the Custodian of the Two Holy Mosques, King Khalid Bin Abdul Aziz AISaud in 1399 H. As part of its historical note, on the right ]eat of the door, the following expression is inscribed, "It was inaugurated, with the Grace of Allah, by King Khalid Bin Abdul Aziz AI-Saud on the twenty-second of Dhul Qa'da, 1399 H". On the left leaf is written; "It was made by Ahmad Ibrahim Badr in Makkah AI-Mukarramah, designed by Muneer AI-Andi". The calligraphy is by Abdul Rahman Amin. A particularly fine motif was made on the frame of the door which was fitted on the left leaf. On the top of the door: O, You Whose Capacity is Limitless. O, You Who Repels Those Things Detrimental to His Creation. O, You Responsible for Good. On the right side: O, You, the All-Knowing. O, You, the Omniscient. O, You, the Most Forbearing. O, You, the Great. O, You, the Wise. O, You, the Compassionate. On the left side: O, You, the Rich anti the Enriching One. O, You, Worthy of All Praise. O. You, the Glorified One. O, You, Glory to Thee. O, You, Whose Help can be Sought. These pure gold plates are carved and fixed to the wooden base. This wooden base is made up of three sections. In the first section, there is a continuous franc decoration, and on the others there are Qur'anic verses. ( 15, pp. 88-90).